The 255-704-B Evaporation Logger is a voltage data logger that connects to the 255-100 Analog Output Evaporation Gauge to provide a recorded history of the evaporation pan level. The 255-704-B Evaporation Logger is a voltage data logger that connects to the 255-100 Analog Output Evaporation Gauge to provide a recorded history of the evaporation pan level. 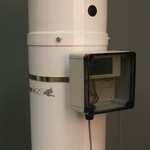 Optional air and water temperature sensors can be connected to the logger to record temperature readings along with pan level. The data can be useful in a wide range of fields such as agriculture, water and waste management, and climatology. 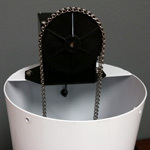 The logger is mounted in a waterproof enclosure that is attached to the outside of the evaporation gauge. The clear cover allows viewing of the current evaporation pan level. Easy to use and reliable, with proper care the 255-704-B will provide years of accurate and reliable measurements. Setup to record the evaporation pan level in inches or millimeters. 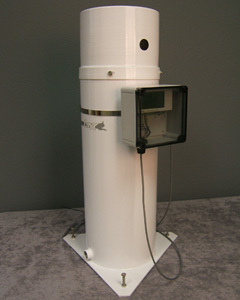 The logger is an 16-bit device and can provide a 0.002" resolution. The software provides easy logger setup. Stored data is collected by direct USB 2.0 interface cable to a laptop or personal computer. Graphing: View multiple parameters on one graph, Zoom and axis-control tools. Logger Status: Verify logger operation and current readings. Export Data to Other Programs: Microsoft® Excel or other ASCII-compatible programs. Requires two AAA 1.5V alkaline batteries with 1 year battery life. Outer enclosure size: 5" x 5" x 3"